Gosh, where did time go?! I didn’t even realize it is November until I was tapped for dinner for friends’ birthday! Of course, I am late for the monthly birthday post as well (what is new!). With my hectic agenda, all I could think of was how to whip up something suitably special to bring to dinner but not have to spend a full day making it. I adapted a recipe for chilled cheesecake from this wonderful book about cheesecakes by Kaori Ishibashi. I’ve found success many times with this book - this would be my 3rd entry that I’m posting here. If you’re interested how other recipes turned out then click here and click here. I chose to do a chilled cheesecake to save time as the baked kind can take a long time and also because it can be prepared ahead of time. 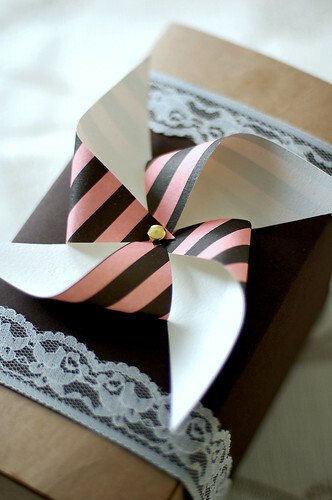 All exquisite in appearance, it is surprisingly easy to make. No, really, it was easy! Probably took me an hour (minus the chilling time). The hardest part was deciding what flavor of cheesecake to make. Knowing that we are having Japanese cuisine for dinner, I decided to go with something Japanesey. Therefore, matcha! I had matcha cheesecake before but I couldn’t really taste the matcha so I have been anxious to make my own. The original recipe has a subtle matcha flavor so I had to adjust to my liking. I suspect that it will taste quite different depending on what type or quality of matcha is used, so make sure you add a little bit at a time and adjust the quantity to your taste. It was paired with Amaretto cheesecake, which has a subtle almond flavor and goes well with matcha. I also recommend pairing with vanilla cheesecake. Aside that this cake was made for people born in November; I had SHF in mind when I added the glaze and the edible gold. Susan of The Well-Seasoned Cook came up with the November theme as “all that glitters” for Sugar High Fridays (SHF). I was thrilled because for once I am not late to submit my entry^^ For those of you who have no idea what is this SHF event: it is this international sweet tooth blogging extravaganza, created by Jennifer at The Domestic Goddess. It has been going strong since October 2004, giving food lovers around the world an excuse to make something sweet each month. I am so excited to be part of this! With this light and mousse-like, yet rich and creamy texture, you’ll return for a second serving and maybe third =) I really like this cake and I hope E & D loved it too! *What is Agar powder/Kanten? Click here! - Wrap the cream cheese in plastic food wrap and place in microwave on low for 1 minute to soften it. - Sift the matcha once; set aside. Place the cream cheese in a mixing bowl. Using a whisk, whisk cream cheese until blended then add in other ingredients in the following order: --> sugar --> lemon juice --> matcha --> whipping cream, make sure that each item is well blended before adding another; set aside. Place milk and kanten powder in a saucepan and bring to boil over medium heat, stirring constantly to avoid mixture sticking to the saucepan. Once boil, turn heat down to low and continue to boil for another minute, stirring constantly to avoid mixture sticking to the saucepan. Remove from heat, then gradually pour the hot milk mixture into the cream cheese mixture while stirring non-stop. Mix well until combined then strain the cheese mixture; pour into the cake mold and let cool. Once cool, place into the fridge and leave to set for 2-3 hours. Place the cream cheese in a mixing bowl. Using a whisk, whisk cream cheese until blended then add in other ingredients in the following order: --> sugar --> vanilla extract --> whipping cream, make sure that each item is well blended before adding another; set aside. Place milk and kanten powder in a saucepan and bring to boil over medium heat, stirring constantly to avoid mixture sticking to the saucepan. Once boil, turn heat down to low and continue to boil for another minute, stirring constantly to avoid mixture sticking to the saucepan. Remove from heat, then gradually pour the hot milk mixture into the cream cheese mixture while stirring non-stop. Mix well until combined then strain the cheese mixture then add in the Amaretto, stir well. 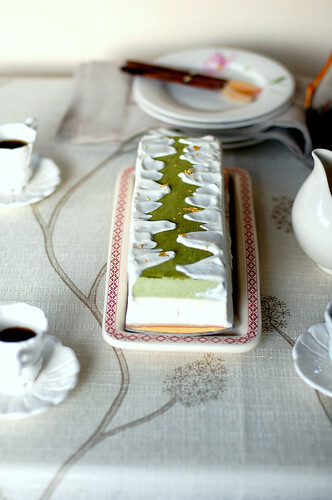 Pour cheese mixture into the cake mold on top of the matcha cheesecake, let cool then place into the fridge and leave to set over night or at least for 3 hours. Combine chilled cream and caster sugar in a mixing bowl; using a handheld mixer, beat cream from low speed and gradually turn to higher speed until peaks form. Chill while you prepare the glaze. Nappage is a neutral glaze use to add shine to pastry. I got it from this place. Stir together matcha, caster sugar and hot water in a small bowl. Once matcha completely melted, heat the neutral glaze on medium heat for 20 second using the microwave then add it to the matcha mixture; stir until completed combined. Let cool to touch before use. To unmold the cakes: wrap a hot towel around the cake mold for 10 second then flip the mold over so the cake can slide out. 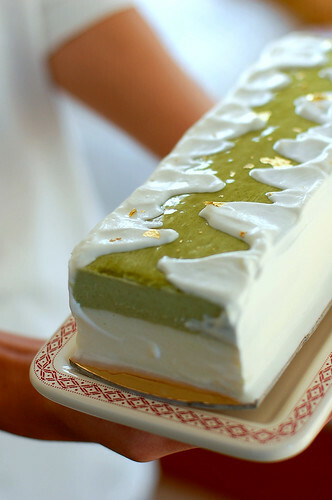 Brush the matcha glaze on top of cake using a pastry brush, then place in the fridge to chill for 10 minutes. Remove cake from fridge, with an icing knife in hand, spread and coat the edges on top and long sides of the cake. Move the knife with long stroke so the cream will appear smooth and mirror-like. Pull the cream atop toward the center so it will resemble melting glacier. Place it back into the fridge another 15 minutes to set. Sprinkle some edible gold before serving. You can get your cake sliced just like the one they sell in the patisseries by following these simple steps: first soak a knife in a cup of hot water, wipe off with a towel, then cut the cake while knife is still warm. Try to cut it through with only one cut and do not “saw”. Whip off any cake crump/residue and slice again. Just repeat these steps and you will have neat and pretty slices of cake that rival what they sell in the patisseries! This cake is absolutely gorgeous! WOW! So beautiful! The 1st photo just like a xmas tree in the snow!! so creative!! Miri - thank you! I hope you'll give this a try! suesse-mahlzeit - so nice to see you again. Thanks for always being so encouraging! This is just so beautiful! What a cake! It's really special! Very beautiful. I love this cake, such a great idea. Yes, indeed, it is a stylish dessert. Monique - Thank you. This cake will be great for the holiday! Latifa - I feel honor that my cake reminds you of a work by a chef but I'm afraid I'm no where close. Very pretty. I love the green of the matcha! 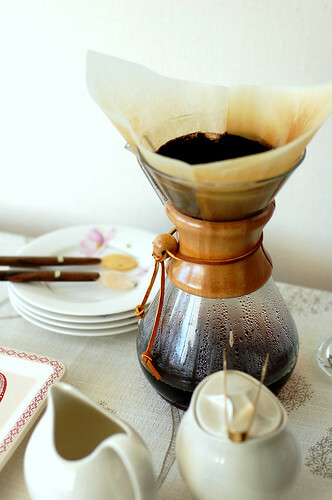 This is astonishingly exquisite, V. Thank you so very much for sharing your lux recipe with SHF! I love your artistic vision with your desserts! They're simply stunning! Thanks for sharing. I love cheesecake, Its look really delicious. This is such a refreshing and creative way of representing a cheesecake! 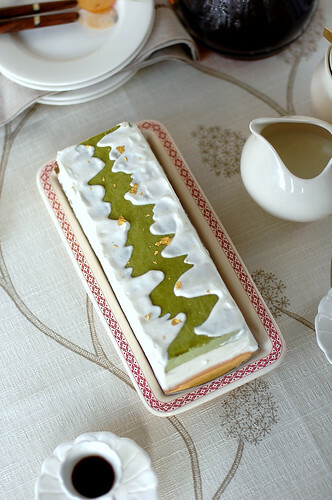 Besides the fact that it looks absolutley marvelous, the design of the cake reminds me of Christmas....! Reading your recipe I noticed an ingredient that I'm not familiar with "nappage". When I used to make fruit tarts I simply used store bought fruit jelly and thin it down slightly with water to make a glaze over the fresh fruits. Would you consider this to be something similar to "nappage"? I have a feeling that is is very different because "nappage" sets, to almost like a jelly form where as the fruit jelly will not do this ? So if that's the case my guess is I won't be able to substitute the fruit jelly if I ever attempt to reconstruct this recipe? Love your site, as always! Thanks for sharing and for posting! Gorgeous cheesecake!! Love your site! I have a question, can I subtitute the agar powder with gelatin? is it the kind of agar powder you mentioned? Thx for sharing! 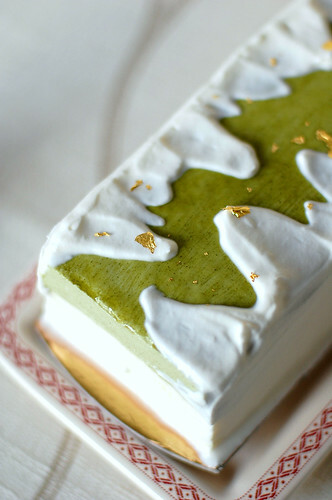 Matcha Green Tea can be used to make a dreamy ice cream. Just scald 1/2 cup of whole milk over low heat and stir in 1/3 cup of raw cane sugar. Stir until the sugar dissolves and then remove the milk/sugar from the stove. In a bowl, whisk three egg yolks together and then slowly pour about 1/4 of the milk/sugar mixture into the bowl with the egg yolks while continuing to whisk. Put the remaining milk/sugar mixture back on the stove on low heat and add your egg yolk mixture into the pot slowly. Stir continuously and wait for the mixture to thicken a little. Then remove it from the heat and pour it back into your bowl. Mix 1 tablespoons Matcha powder and 1/8 cup water together to form a paste. Mix that with 1 cup heavy cream and 1 teaspoon vanilla and add that Matcha mix to your milk/yolk mix. Whisk them together, and allow them to cool. Add this mixture to your ice cream maker and enjoy!